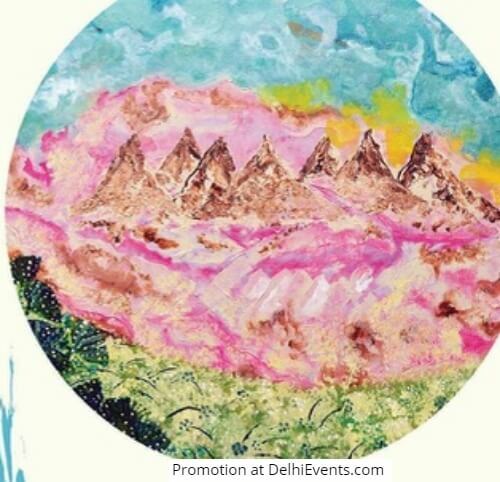 Event Description : ART EXHIBITION "Dreamscapes" a solo art show by Parul Mehra. As a Visual Artist I like to observe & reflect on my surroundings & that has an impact on my psyche sub - consciously. Having been trained in Architecture & Art in my formative years, my thinking is multi- dimensional ,delving into various mediums & always experimenting . Art for me is a means of connecting with my higher spiritual being . A means of meditation & attaining zen like tranquility . I for one, am an Intrinsically blithe individual, which is reflected In the colour palette I use. Dreams is a phenomena which fascinates me & to project the ideas of the mystical, that which cannot be explained, is always a challenge . I have tried to portray that mysticism and a few whimsical ideas on paper & canvas, in mixed media for this exhibition . This will make my audience ponder & think about the possibilities, as to who made this universe & its many diverse elements. As an artist it is my constant endeavour to engage my audience. Not just display the artworks but also interact with my audience & learn from their perspective. An artist in my belief, has to be intrisicaly happy to become the beacon of positivity . My works are a reflection of that sub - concious state of mind, where dreams & reality merge. A middle realm, lucid & fluid . The reflections within, compel us to wonder that are dreams a projection of our fantasies or a reality check of our current state of mind ? We all dream & some dreams scare us. They are the vivid depictions of our deepest fears, some are delightful dreams, making us feel elated. Being played out like a movie, with no control of our own & projection of varied images being flashed across our mind scapes! Some maybe implying a wish fulfilment or a deja - vu like situation, some even occurring when the eyes are wide awake. Each dream is a blurred story, with no comprehensive beginning or end. It is a fascinating natural phenomenon & hence the theme of my 5th Solo show. Artist quote : Art is a powerful tool of communication which can highlight the issues of any era, for generations to follow . Art has the ability to change perceptions !